My neighbor, Yehudit, happened to have a bunch of unused fresh dill which she donated to my cause in return for a share in the good eats. My mother's original recipe contained parsley, but I figured I'd swap it for dill since I could lay my hands on fresh herbs. This turned out to be a very welcome flavor - but it wasn't enough. The texture of these first attempt latkes wasn't that great. Notice how they are shredded in the picture. 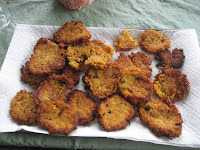 Most "authentic" recipes for potato latkes call for grating or shredding the potatoes and onion, in an attempt to mimic the hand grating that was always done in centuries past. Being a sucker for authenticity, I tried this and was underwhelmed - the onion flavor didn't permeate the pancake. So I decided to throw authenticity out the window and switched to the blade of my food processor to make quick work of pureeing the potatoes and onions. The pureed mixture gave a much more even flavor distribution. I was also able to produce a fluffier texture by adding a teaspon of baking powder. Finally, I added some chopped scallions to accent the onion flavor. I ended up playing around with the flour amount and decided that increasing it from the original 2 tbsp that I started with to 3 tbsp was a better idea. This helped the pureed mixture absorb more moisture (good for frying - see below), which the shredded mixture did not do as well. The other major part of creating a delicious latke is the frying itself. Seems straightforward, doesn't it? Well, it's not. 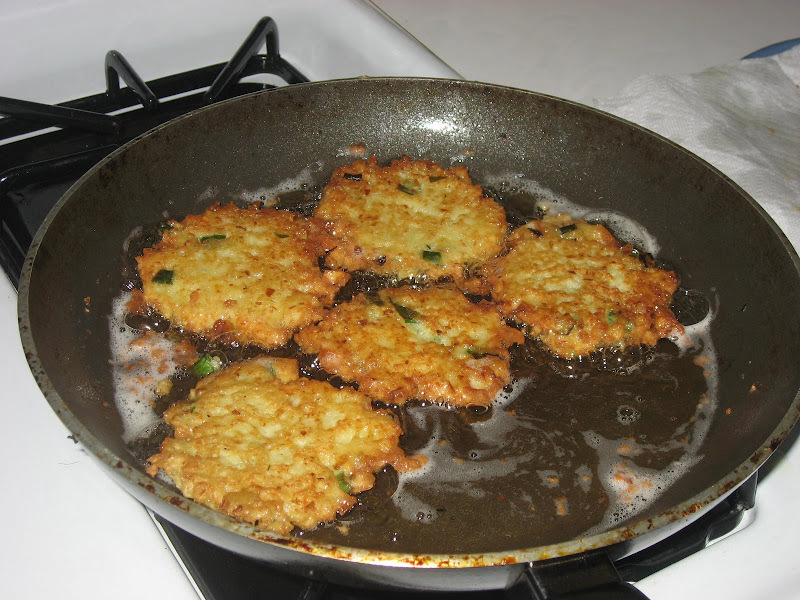 There are several major concerns when frying latkes: 1) oil splatter and 2) uneven cooking, 3) greasy latkes. By my fourth (and last) batch of latkes, I was able to solve all three of these problems. My first batch had the problem of uneven cooking - the outside browned very quickly and the inside was still not perfectly cooked. This was because I had the heat on high, in an attempt to hasten the process. Bad idea. Lower the heat to medium-high or medium. Trust me - when recipes say its 2-5 minutes per side of latke, they actually mean it! I tried to speed it up and the results were not good. My second batch had the problem of greasiness - the latkes came out way too oily and floppy. They also took way longer to cook than I expected. These were solved by careful monitoring of the oil temperature. The ideal oil temperature for frying a latke, in my opinion, is 375 - the same temperature I use in the second frying stage of a french fry (come to think of it, another experiment I might have liked to try would be the 2-stage frying like one would do with french fries, just to see if it works with latkes too. Then again, that's deep frying and this is pan frying, so maybe not...). It is really important that you not put the latke batter in the pan until the oil comes up to temperature (it really is worthwhile to invest in an oil/candy thermometer). The reason (as per Alton Brown's explanation on frying) is because when the oil is hot enough, the batter will exude steam from its insides. This escaping steam pressure repels the oil and prevents it from entering the crevasses. 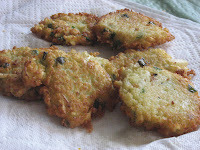 As long as there is steam escaping, there is not oil entering - and the inside of the latke actually cooks by steaming! Putting the batter in at too low a temperature will cause the steam to evaporate long before optimum browning temperature is reached, which means the final browned latke will be greasy. It will also extend your cooking time by making it take longer to reach the optimum browning temperature. Adding more oil after every 2 batches ensures that the temperature doesn't get too high. And finally, the problem of oil splatter. Frying with oil can be very dangerous if you have very wet food. Drops of water in oil will cause the oil to pop and splatter everywhere, including your skin. The solution to this is to get rid of as much water as possible before frying! This leads to the extra step of draining the onions and potatoes. I also picked up a tip from the Kosher Blog's Potato Latke Master Recipe to wash the potatoes to get rid of excess starch, a tip I have also used in the past for making mashed potatoes. All in all, I cooked 4 batches of latkes, learning something new from each one. 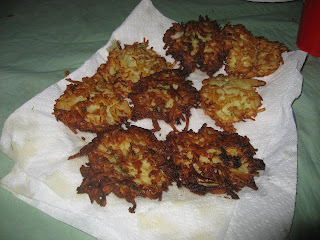 By the end, I could say I knew how to make great latkes my way. So while there are plenty of recipes claiming to have the perfect latke recipe, I can tell you that my recipe is one of the few I definitely plan on making the same way twice. 1. Fit a food processor with the rotating blade. Peel onion and puree it. Transfer onion puree to a colander or mesh strainer in a sink or over a bowl, but do not wash out the food processor bowl. 2. Puree potatoes by pulsing the processor a few times. You may need to work in smaller batches of potatoes to get an even puree. Transfer these to the strainer as well and mix with your hands a bit. 3. Rinse the puree mixture a little with water and allow to stand for a few seconds to drain. Using a tea towel, or your hands, squeeze out as much water as you can from the puree mixture. If using your hands, be sure to cup your hands around it tightly to avoid the mixture seeping through. Place the squeezed mixture into a work bowl. 4. Add lemon juice to the mixture. Beat the eggs, and add them, along with the flour, baking soda, scallions, and herbs. Add salt (I can't tell you how much exactly beyond "a heavy pinch" - do this with care though, since this can make the difference between a good and a bad latke) and ground black pepper to taste. Mix very well until thoroughly combined. 5. Heat oil in a heavy-bottomed pan or skillet. Oil should come up about 1/3 to 1/2 the desired height of the latke - probably about 1/2 cup, but eyeball it - you don't just want to coat the bottom of the pan, you want about twice that amount. Wait until the oil temperature reaches 375 degrees. 6. Using a wooden spoon, scoop heaping spoonfuls of batter mixture into the hot oil. Press with a spatula to flatten and form into the shape you like. Put in no more than 4 or 5 latkes into the pan at a time. 7. Fry until one side is golden brown, then flip and repeat. Each side should take between 2-5 minutes. 8. Transfer to a paper-towel lined cooling rack, baking sheet or plate when both sides are done. Finish cooking the entire batch before putting in more batter. Every 2 batches, add more oil to get back to the amount you originally had. Before putting in a new batch, always wait for the oil temperature to come back up - that's very important! Serve with applesauce (store-bought or homemade) and/or sour cream. Follow above recipe, except substitute 2 or 3 sweet potatoes for regular potatoes. You may want to add a little cinnamon or nutmeg too to bring out the sweet potato flavor.